Michelle Wie has earned a spot on the LPGA Tour. The 19-year-old from Hawaii overcame a miserable start Sunday with a safe finish for a 2-over 74 that had her comfortably among the top 20 at the LPGA qualifying tournament. 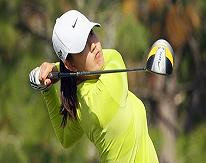 Wie has been playing mostly on sponsor exemptions for the last seven years, when she became a sensation for her youth and power, and her unsuccessful quest to compete against the men. Wie tied for seventh and now takes her place as part of the 2009 rookie class, along with Q-school medalist Stacy Lewis, who birdied the last two holes for a 3-under 69 for a three-shot victory at LPGA International in Daytona Beach. I’m going out on a limb and predict Michelle both wins an LPGA Tour event and makes the 2009 Solheim Cup team.